That’s what one of last year’s returning students had to say about the West Coast ‘Ukulele Retreat. And he’s just one of many. 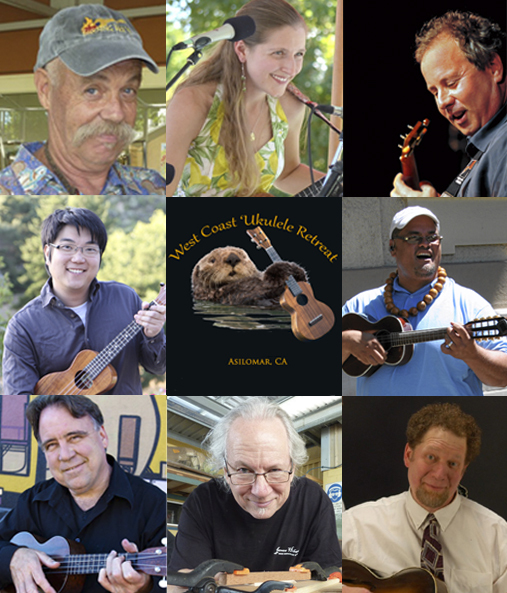 The 2013 West Coast Ukulele Retreat, May 8 – 12, is already 3/4 full! But it’s not too late to join us. Early Bird Registration will remain open until November 1, 2012. Click here to download the Early Bird Registration Form. It must be postmarked by November 1. We’ve got another great, hand-picked line-up for next year including some oldies but goodies, along with a few newcomers that have a lot top share: Andy Andrews, Sarah Maisel, Gerald Ross, Jason Arimoto, Kumu Pomaika’i, Dave Egan, Rick Turner, and Joel Eckhaus. You can read more about them individually on the Instructors page. We don’t have specific workshops listed, yet, for 2012. But rest assured that every year we learn more about you and how we can help you make the most of your time at Asilomar through classes, workshops, jam sessions, individual time with specific instructors, office hours, and more. You deserve to get your money’s worth, and to that end we try to keep the staff-to-student ratio at about 1:8. Still in doubt? Visit the website to see what folks had to say about their experience last year. ~ by UkuleleLady on October 22, 2012.